Where do we even begin this week? First of all, Stoneforge Mystic is spiking pretty hard, due to pure speculation that it’ll be next to be unbanned. 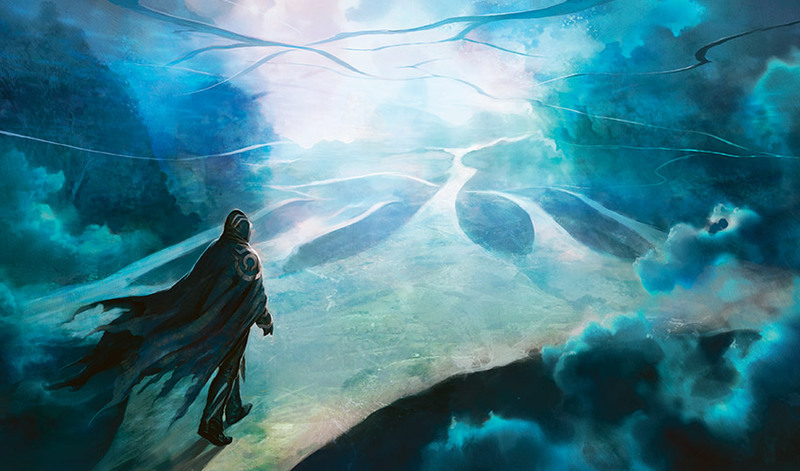 The play here is clearly the Grand Prix foils, because if it does get unbanned it’ll also get reprinted (as they did with Jace, the Mind Sculptor) so you want to have the more unique version and the pack foils are already super pricey. More immediately relevant is that we got the list for Core Set 2019 several weeks earlier than usual, for reasons that aren’t 100% clear to me. The prerelease is next weekend, but we got the full list last Friday, an unusual move. Is it because they wanted all eyes on the underwhelming Silver Showdown announcement? Having more time with the cards also means we’ve got more time to figure out what to preorder, if anything. As I’ve said, I usually stay away from preorders, but there have been some BIG opportunities for preorders lately. 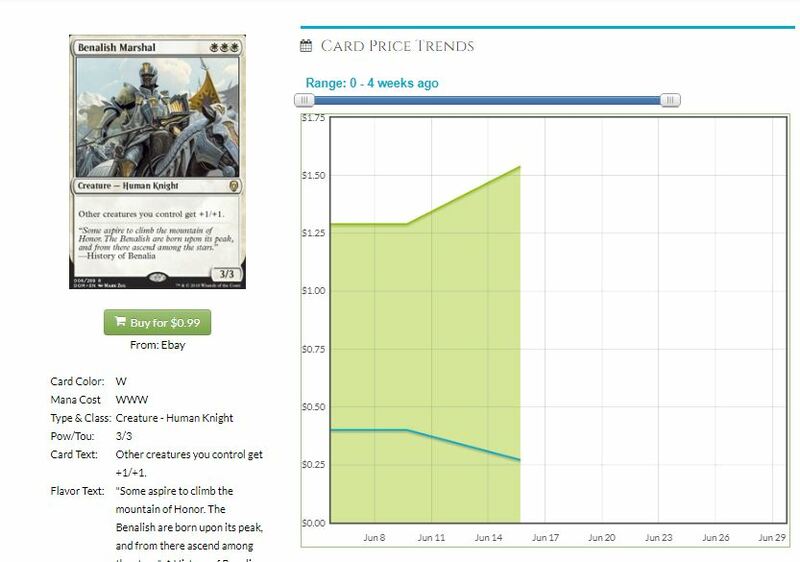 Karn preordered for $30, and his retail hit $70. Teferi could have been had at $15, and he’s buylisting at $22 right now. Search for Azcanta was a $4 preorder! 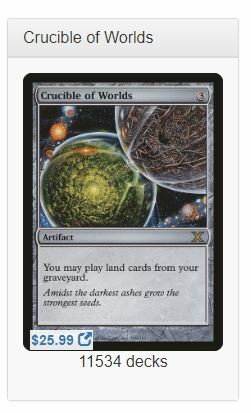 Crucible of Worlds (preselling at $25): This is not the play at all, and much like Scapeshift, this is a dagger to the eventual price. This sees a little bit of Modern play, and yes it’s in 11,000 EDH decks over on EDHREC, but there’s been the original, and the Tenth Edition, and the Invention, and now this. 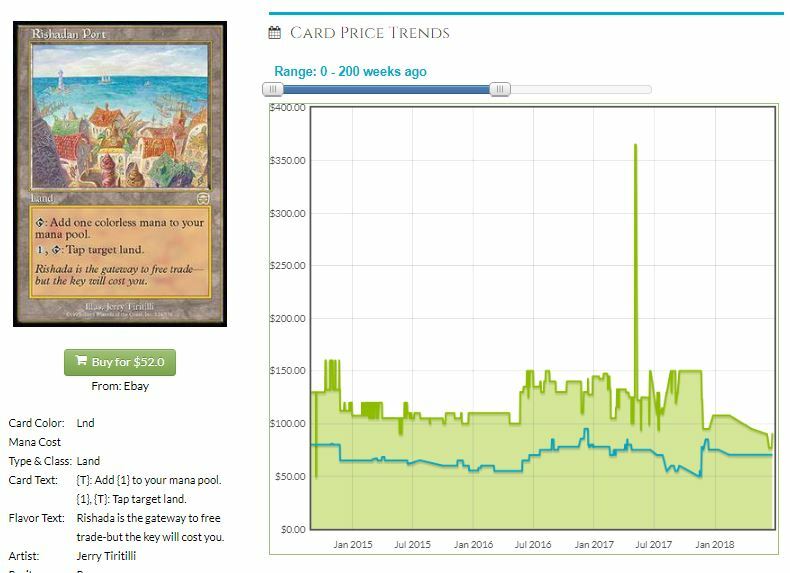 It’s going to stay right around $25 because there won’t be any new demand for the card, much like what’s happened to the price of Rishadan Port. Stay away. Don’t do it. Not yet, at least. Infernal Reckoning ($4): Now this I can get into. It’s not going to be maindeck in Modern, but there’s a couple of commonly played, super spicy targets in Standard right now: Heart of Kiraan and Scrapheap Scrounger. I don’t think this price is low enough, but I do see it jumping to $6 right away. If you want to get your set right now in the $10-$12 range, I think that’s solid if you’re going to play it. Saves you a few bucks. Runic Armasaur ($3): I dearly love this card for Commander play, as there’s no end of annoying things that you can draw cards from. I want it to be good in Standard but there’s not a whole lot of creature abilities going off. This is excellent against a transformed Azcanta, yes, but they aren’t going to let this card stay in play. I don’t think someone else would activate Arch of Orazca with this on the field. Cleansing Nova ($3): Here’s a pretty safe play: get four or eight of these right now, or in a couple of weeks. It’s worse than Fumigate in control decks, but when that card rotates in late September, this is now the default five-mana board wipe. It’ll jump to $6 or $7 then, and that’s why I don’t want to go too deep. It’ll buylist for a couple bucks more than what you paid, but this is a pickup for trading. I love buying cards at $3 that I’m going to trade away like mad at $7. Nexus of Fate ($34): Holy crap I didn’t know this had gone so high. The EV here is pretty kooky. You get a box from from your LGS at $120ish, and immediately you can eBay this for a fourth of the cost? Pretty tempting. I’m terrified of this being a two-of in the next iteration of control decks, but what is really going to get me is the amount of Commander play it’ll see. This is a long-term hold if you’re a buyer right now, because if the price goes too much higher there’s going to be some unethical stores/employees that will just sell theirs. The price on this might hit $60 in a couple of years, though, because there isn’t going to be that much supply out there. Leonin Warleader ($3): White Weenie is back everyone! It’s got tokens, a range of anthems and lords, and this is a top end that ends the game very very quickly if not answered. I’m calling this as a card that will spike at some point in the next two months, as a deck featuring four of these will push it up to $6, and it’ll bring Benalish Marshal along, which should hit $4-$5 again. That’s a deck I’d love to play, especially if I splash a little green for a set of Heroic Intervention or play a few of the new reprint Make a Stand. It’s a buck and that defines speculation! Death Baron ($5): We are being pushed to Zombie tribal pretty hard, but we do have this and Lord of the Accursed as lords to make the push worthwhile. I don’t remember the Baron being Standard-playable, but I like living in this world. The price on this is going to 100% be dependent on being good in Standard, because we also have a promo version to chase and there’s not an overwhelming number of Zombie decks in Commander. Cliff has been writing for MTGPrice for nearly five years now, and is an eager Commander player, Draft enthusiast, and Cube fanatic. He’s the official substitute teacher of MTG Fast Finance, and if you’re going to be at GP Sacramento, look for the guy under the giant flashing ‘Cube Draft’ sign and he’ll have you drafting in no time!